Coffee and tea fans, take heed: there's a new spot in Oakland serving fresh brews. 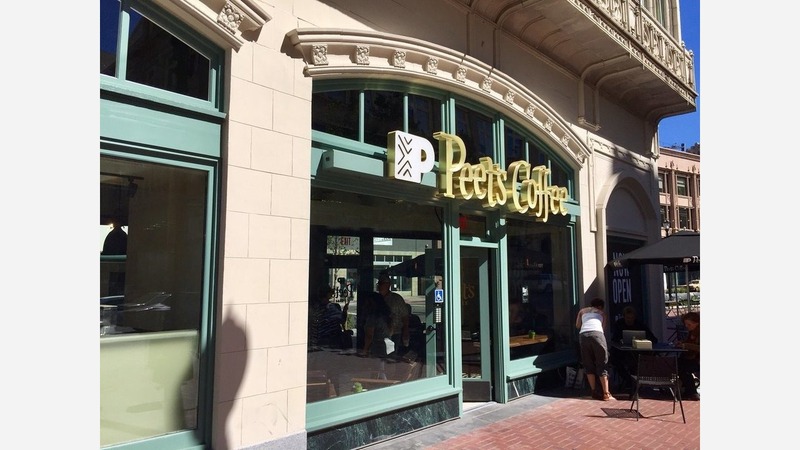 The new addition, Peet's Coffee, is located at 1615 Broadway on the ground floor of the historic Cathedral Building. The new flatiron cafe doesn't offer much seating, but it does offer a variety of options for coffee, tea and food, such as pastries, sandwiches and more. (Check out the full menu here.) For an al fresco experience, the plaza outside at Latham Square offers ample seating. With a 4.5-star rating out of four reviews on Yelp so far, Peet's Coffee is off to a positive start. Juan V., who reviewed the new spot on July 17, said the new location is, "Very spacious and very clean. Great white chocolate mocha. This is my new nearest Peet's Coffee in Uptown Oakland." "The location is modern and bright. Since the store is at a corner, it's bright with windows on two sides," wrote Al L. There about twelve tables inside with several out front. On this opening day, service was friendly and efficient. For real coffee lovers, it's great that another Peet's has opened in the area." Peet's Coffee is open from 5:30 a.m.-7 p.m. on weekdays, 7 a.m.-7 p.m. on Saturday, and 8 a.m.-2 p.m. on Sunday.